On Gardening Australia on ABC TV tonight this story about Bonsai Australian Plants was shown. I have often admired these and thought I would love to try some. However, as potted plants and I don’t always get along, I dismiss it as being doomed to failure. Seeing some of the plants on TV was great and there is a photo to see on the site. I have copied the text here. â€œHi. I’m Brian Sampson. I’m probably better known in public life as an Essendon footballer. I was fortunate enough to play in a couple of premiership teams, in ’62 and ’65. I’ve been 50 years a bricklayer, many years a netball coach and now a passionate lawn bowls player but bonsai has been a big part of my life. â€œWhen I first started, back in the 1980s, there were a few people who grew natives but now there are more people growing natives in their collections and a lot of great bonsai growers around Australia. If you’ve got a bit of artistic flair and a bit of imagination, the world’s at your feet. â€œOnce I used to go for a drive in the bush and there were just trees. Now I look at different tree styles in the bush and imagine how to incorporate them as a bonsai. Australian natives are particularly suited to what I like doing â€“ landscapes – because a landscape has to look natural and you don’t have to design them by the rules of bonsai. â€œThe ideal height to see all the details of a bonsai tree is about 2 feet. Then you can see the beautiful details of the roots, the bark, all the little knots and gnarls on the tree, which gives an illusion of age. And the furrowed look on the bark of the paperbarks and callistemons – it’s a natural aged look. Really, bonsai is an illusion. You have to learn to make a tree look old. It’s not because it is old. You make it look old. â€œSome favourites in the collection are: an Angophora, which is beautiful when the bark starts peeling off and the Quercus suber, or evergreen oak which is what they make cork out of. â€œThere are so many varieties of native trees in Australia. We have the beautiful paperbarks, the bottlebrush, wattle, and Australian eucalypts. We’ve only scratched the surface. There’s literally hundreds of potential bonsai that we haven’t even touched yet. â€œTo make a bonsai using an Australian native such as a Callistemon ‘Captain Cook is very easy to do. The first thing, to bring out the best features of an Australian native, is to expose the top 3 inches of roots and branch (that are usually below the soil) for a lovely gnarled look. â€œThe next stage is to tease the roots. Take off as much as is safe around the base of the plant. Now work out which branches need to be taken off because they are impeding the style of the tree. Cut off any little branches and peel the bark back to expose any dead wood. â€œIn the pot, itâ€™s very important to have gauze over the drainage holes, so the soil doesn’t dry out. Two wires are used to hold the plant secure in the pot. â€œAdd a little bit of drainage gravel, then a little potting mix. It’s a mixture of pine bark, peat moss and some fine gravel. â€œTry to plant the tree at the right angle. This part is important. Wire the tree in. There are two different types of wires used in bonsai – aluminium or copper. Copper is stronger. Aluminium is a little more pliable. I tend to use aluminium. Banksias are such dramatic flowers. 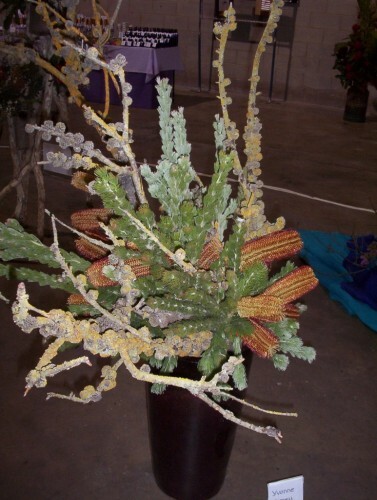 There are two different species in this arrangement, plus the seed cone of another species. A typical piece of Australiana is the old gnarled piece of mallee stump. When we used to get to the city for shopping, when living in the north of the state it was always a treat to see the flower stalls in Rundle mall, the main shopping precinct in the CBD. 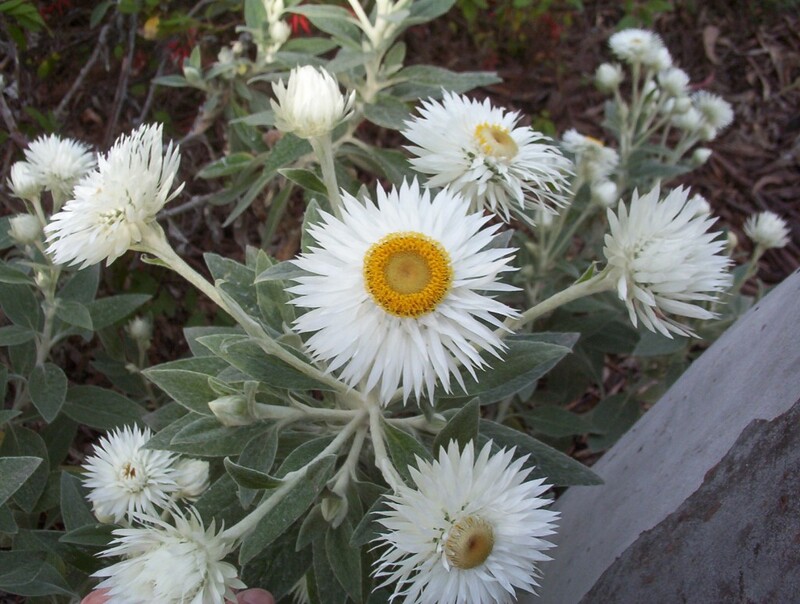 There were always buckets of Banksia flowers. I would buy a few of each to take home and place in water to enjoy the real colours. When the water evaporated the flowers would dry and keep for months. I often used the leaves with their different serrations as shapes for stencilling. I enjoy the skill and creativity of the people who did these floral arrangements in Sogersu School of Ikebana. 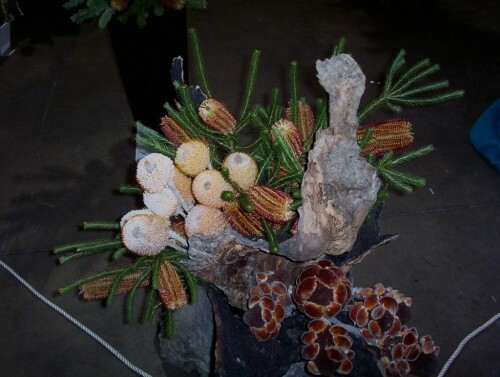 This is another of the flower arrangements in a form of Ikebana. The featured flowers are Banksia spinulosa and Woolly Bush (Adenanthos sericeus). Also featured are gnarled pieces of one of the She-Oak family (Allocasuarina). The old seed cones have been retained and some yellow lichen has been left on the stems, also. Woolly Bush is a wonderful plant. It has a green and grey appearance as the camera flash has picked up in the photo. 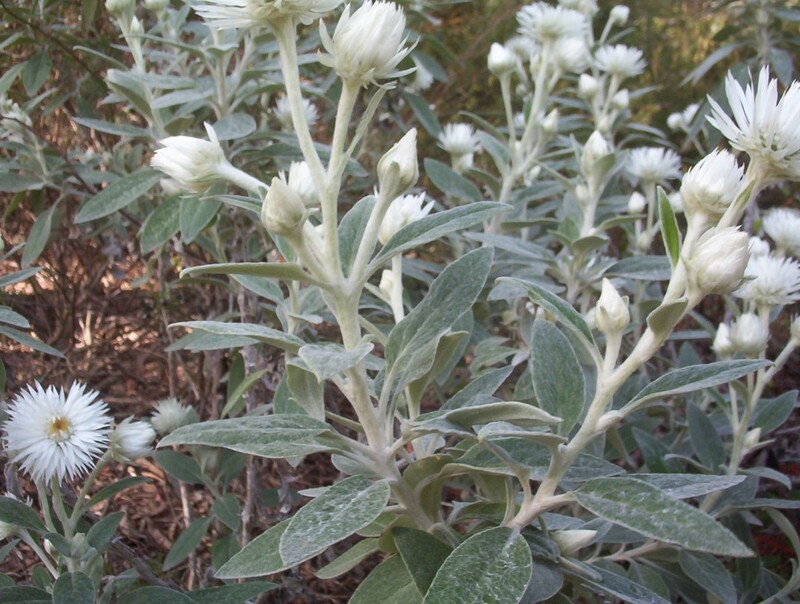 It is one of those plants that one has to touch because of the soft woolly feel of the foliage. This plant grows well here with good drainage and in the alkaline soil, too. It has small, red jug-shaped flowers that are also attractive but the foliage is the feature. I really like the way these flower arrangements show off Australian native Plants. I was very annoyed with myself when I took the first photo of a Waratah arrangement similar to this. When I downloaded the photo to the computer there was a red fire extingusher at the side of the arrangement. I did not see it when I took the photo. The colour was identical to the Waratah. 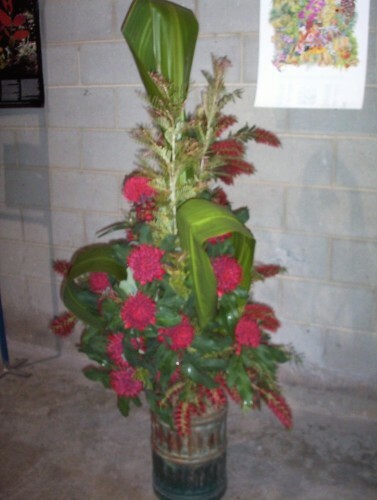 Waratah is the common name for Telopea speciosissima which is the Floral Emblem of New South Wales. This plant can grow to three metres tall. The flower head can be nearly the size of a dinner plate. I have a friend who enjoys folk art. She had never seen a Waratah flower ‘in the flesh’ so when she painted one it was too small in proportion to the other blooms she painted. She realised the mistake when shown a real flower. They need very good drainage to be successful as a garden plant. Cutting the flowers encourages more shoots and therefore more flowers for the following season. You are currently browsing the archives for the Using Australian Natives category.